There is one case listed in the Supreme Court this week, the joined appeals known as AM (Somalia) v Entry Clearance Officer, previewed on the blog yesterday. This will be heard by a five judge panel on Monday through to Thursday next week. The Equality and Human Rights Commission is intervening in last appeal in the series – the appeal which raises issues under Article 14 of the European Convention on Human Rights. We draw attention to the charming “group photograph” of the Justices on the right – published last month but which we had previously missed. We came across it on the US Blog, “Washington Briefs“, with the engaging caption “The British Justices also have snazzier robes”. 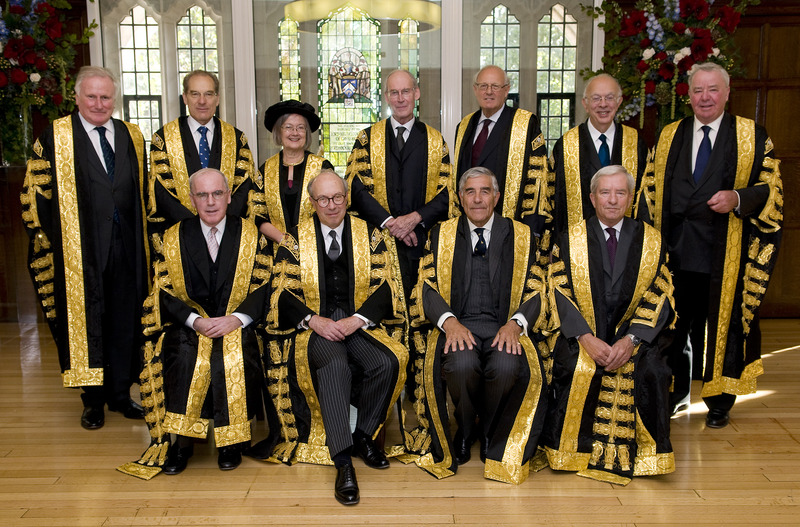 This kind of “group portrait” is common for other Supreme Courts but this is the first UK one we have seen. The photograph is by Ron Coello. The other hearing at the Middlesex Guildhall next week is In the remarkable Trinidadian case of McNicolls v Judicial Commission. This is being heard on Monday by a five judge panel of the Judicial Committee of the Privy Council including four Supreme Court Justices and retired Court of Appeal judge Sir Jonathan Parker. This case is previewed here. The case can be found on the “Current Cases” page of the JCPC here. No judgments have been announced for next week. There are now 6 judgments awaited in Supreme Court Appeals (and one on the “anonymity” issue in A v HM Treasury) along with 8 judgments from the Judicial Committee of the House of Lords, going back to the case of Secretary of State for Environment, Food and Rural Affairs v Meier which was heard on the 10 and 11 June 2009. Although the Court has not announced any permission to appeal decisions, it does appear that permission decisions are being made but are not being publicly announced as such. The ICLR list of Supreme Court decisions on permission to appeal – to which we link on the right hand side – has not been updated since the last House of Lords decision on 31 July 2009. Formerly such decisions could be found on this site, on the House of Lords Business website and, from time to time, in the Weekly Law Reports. All that has emerged since 1 October 2009 is one permission decision which can be discovered by close study of the “Case Details” section of the website: permission to appeal was granted in AM (Somalia) v Entry Clearance Officer on 8 October 2009 by Lord Hope, Lord Rodger and Lord Brown. It could, perhaps, have been assumed that permission had been granted in this case as it is being heard on Monday! Leave a reply on "In the Supreme Court w/c 9 November 2009 [updated]"